Journal of Surgery and Emergency Medicine is a newly started international peer reviewed journal, the journal dealing with general surgeries like, vascular, brain, abdominal, heart, head, breast, brain, neck, colorectal, and other forms of surgery also it covers pre-hospital and hospital emergency medicine, and critical care. 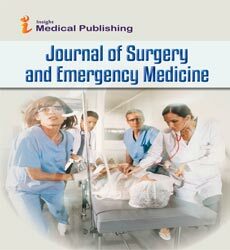 Journal of Surgery and Emergency Medicine aim is to publish general surgeries and critical care, emergency medicine materials on all aspects of surgeries and Emergency Medicine. We publish all types of write ups like Research findings, evidence-based reviews, commentaries on resuscitation, trauma, major and minor injuries, Clinical and medical case reports, Short communications, commentary, Images, Video articles, technical evaluations and Thesis etc. Orthopedic surgery is a surgery done by orthopedist which deals with the problems in bones and uses both surgical and non surgical way of treatment for the diseases like spine diseases, injuries, joints, tumors etc. Neurosurgery is concerned with the diagnosing and performing treatment for any part of nervous system which includes brain, heart, spinal cord etc. Plastic surgery is a process of reconstruction of the injured parts of the body with the help of tissue transformation. Pediatric Anesthesia: Where a child is injected with anesthesia, which makes short time muscle relaxation and prevent from pain or it makes the child unconscious for a short period of time. Robotic surgery is where the surgery is done by a robotic structure attached with small tools which was operated by the surgeon with the help of computer. General surgery is a surgery which focuses on abdominal parts like stomach, liver, pancreas, gallbladder, bile ducts not only these it also invloves treating diseases like skin, trauma, breast etc. Surgical education is where a group of people form as an association and coordinate with each other with educational activities within the hospitals. Emergency medical services is which gives priority to basic treatment for the diseased person with the help of ambulance services and providing medical care out of hospitals. Hypothyroidism is an inactive thyroid which does not produce adeaquate thyroid hormone. Bariatric Surgery is performed to the patients suffering with obesity, this is done by reducing the weight of the patient. Acute medical care is a part of health care, the patient is provided with active and short time treatment for illness or during recovery from surgery. Vision loss mostly occurs to old age people due to damage of optic nerve or retina and the lens of the eye become opaque. Trauma Surgery which involves operative and non-operative methods to treat traumatic injuries caused by accidents.